ORLANDO — Pop star phenom Justin Bieber wowed his enthusiastic fans, know as “Beliebers,” that filled a sold-out Amway Center arena with deafening screams on Friday, Jan. 25. Bieber asked his fans on stage near the start of his performance “I want to know how many of you have seen me in concert before?” This was followed by an uproarious reaction from the over 12,000 in attendance. Like most major concert performances, this show was just as much about the extras as the music. Video monitors with flashing transitions, pyrotechnics and laser light displays and an elaborate triple layered stage, laid the foundation for a cutting edge live event. A grand entrance from Bieber himself started the show. As the young performer descended from the top of the main stage to the center stage catwalk, adorned by giant silver wings made from the shapes of musical instruments, a back-up band and large dance crew accompanied the singer throughout a majority of the concert. Most of his songs are fast paced jams built for dance clubs, and his performance reflects this with pop-n-lock moves and crowd interaction. With all the extra showmanship aside, the young performer has a soulful sound that is most recognizable when he slows down his performance to sing in a capella. Two of his songs “Be Alright” and “Fall,” were performed midway through the concert with only an acoustic guitar and demonstrated a level of mellow diversity. He also used this acoustic moment in the show to mention his newest album “Believe Acoustic” will be available to purchase on Jan. 29. “I truly think he's a good person, and I've been a fan of his throughout his progression of becoming famous and becoming an adult,” said Zoe Manhan. She also recently saw the group One Direction perform at the Amway Center, but felt that Beiber's show was far more entertaining even though he is only a solo artist compared to a group performance. Also accompanying Bieber at the concert was surprise guest Mike Posner, who performed his hit song “Cooler Than Me.” Posner also wrote and produced Bieber's hit song “Boyfriend,” and has worked with several other popular musical artist in recent years. An up-and-coming Australian pop singer, Cody Simpson, 16, was the opening act for Bieder's Orlando show. “I'm a long way from home right now, but it means a lot to be able to come all the way down here to Florida,” said Simpson on stage. He took over as opening act after the original opening artist Carly Rae Jepsen announced at the beginning of the month she would not be attending the “Believe” shows in Orlando and Miami. Bieber's two most popular songs “Boyfriend” and “Baby” that have received over one billion views on YouTube combined, were saved till the end of the concert for his encore songs. The thunderous chanting of “Justin Justin Justin,” demonstrated the need for his fans to hear just a few more songs before calling it a night. His “Believe Tour” is only the second concert tour for the 18-year-old Canadian singer, and kicked off back in September of last year. In total, it is currently scheduled for over 100 performances across America, Canada, Europe, and Africa, and “Believe” is well on its way to being one of the top grossing tours of this year. Thousands of fans filled the sold-out Amway Center in Orando, to see Justin Bieber on his "Believe Tour." 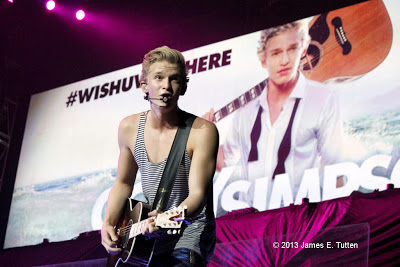 Bieber's opening act, Cody Simpson, on stage at the Amway Center in Orlando. Bieber sings from the top level on stage at the Amway Center in Orlando.